“Chill cookie dough in the refrigerator, covered, for one hour.” You’ve seen that set of instructions in your cookie recipe. But why? Cookie logic says if going to put the cookies in the oven anyway, then chilling the dough beforehand simply means you have to bake them longer. Not so. Cookie chemistry trumps cookie logic. The colder temperatures in the fridge have an impact on the ingredients in the dough. There are two main reasons a recipe calls for you to seal the mixing bowl with plastic wrap and pop it in the fridge before popping the cookies in the oven. Rolled cookie dough (such as sugar cookie dough) requires handling. Butter or margarine in the dough is easier to work with at a cool temperature than at room temperature. At room temperature, the fats are sticky. They can cling to the rolling pin, cookie cutters, and surface area before reaching the baking tray, creating frustration. Chilled dough means cooler butter or margarine making dough is easier to handle, roll out, cut, and move them to the baking sheet. Another case for chilled dough: refrigerator cookies (icebox cookies). The dough is rolled into a log, wrapped in plastic or waxed paper, and chilled until firm – an hour or two. This allows you to cut cookies cleanly and evenly before placing them on the baking sheet. If your cookie recipe tells you to chill the dough before rolling it out or cutting it into slices, do so. You will save yourself a headache. Even if the recipe doesn’t specify a time out for the dough in the fridge and the dough is sticky when you handle it, go ahead and pop it in the refrigerator just to give yourself a chance at sanity. When the cookie recipe contains flour, you may want to consider chilling the dough before baking – especially if your drop cookies tend to spread too thin in your oven. Chilling permits the gluten strands in the flour to relax, avoiding a “rubbery” consistency in the cookies when baked. The sitting time allows the flour to absorb more of the moisture from the other ingredients in the dough. When baked, the cookies don’t spread out so much. The baked texture is softer, too. 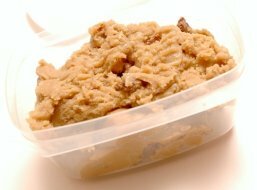 How Long Should You Chill Cookie Dough? Why might a recipe call for a wide range of chill time, such as one hour to overnight to 24 hours? The argument here is that a longer chill time allows flavors in the dough to develop. In other words, delayed gratification.